During the First World War approximately 3000 Canadian soldiers were taken prisoner in Europe. As both Jonathan Vance and Desmond Morton have noted, Canadian POWs typically experienced a combination of monotony, drudgery and depression, often coupled with a sense of shame at having been captured. Accordingly, many POWs felt a driving need to escape, despite the threats of punishment they would receive if they were caught; perhaps evidence of the same spirit of duty and adventure that led them to enlist in the first place. One prisoner with a strong desire for freedom was Sergeant William A. “Bill” Alldritt, DCM. Sgt. Alldritt was a YMCA Physical Director employed in Winnipeg before (and again after) the war. He enlisted as a member of the 8th Battalion, Canadian Expeditionary Force (90th Winnipeg Rifles), and distinguished himself as a machine gunner during the Second Battle of Ypres, where he was captured on April 25th, 1915. As a POW, Sgt. Alldritt wrote home prolifically. His letters document life in the camps and work kommandos (work parties detached from the main camps) where he was held captive. Escape usually required planning, mapping routes, and acquiring tools to move soil or cut through barbed wire. Many of these supplies were sent from home in food parcels that were freely allowed in POW camps, at least during the early years of the war. Requests for these supplies had to be couched in an easily understandable and often highly personal code that friends and family members at home might piece together, but would pass under the watchful eyes of German censors. One of my great desires at this time was to have a compass, for Bromley and I were determined to make another attempt at escape, just as soon as we could, and many an hour I spent trying to find a way to get the information out to my friends that I wanted a compass. At last, after considerable thinking, I sent the following card to a friend of mine with whom I had often worked out puzzles, and who I felt would be as likely to see through this as any one I could think of. DEAR JIM: – I send you this card along with another to come later, which please pass on to Fred. In next parcel, send cheese, please. In the address I slipped in the words – ‘SeaforthWds.’ This I hoped the censor would take to mean – ‘Seaforth Woods’; and which I hoped my friend would read to mean – ‘See fourth words’; and would proceed to do so. Reading only the fourth words in Simmons’ short note yields: “send along come pass in cheese”. By this time, November, 1916, Pte. Combe had been transferred from a POW camp in Germany to a convalescent hospital in Mürren, Switzerland, where he began his repatriation process. Combe’s letter provided Ethel with advice as to how she could assist her brother, as he was able to write from Mürren without concern for censorship. 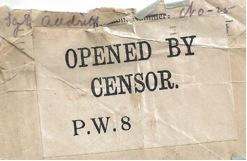 A censor’s stamp on one of Alldritt’s letters home. 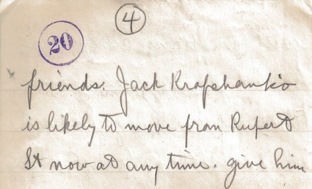 An excerpt from one of Alldritt’s “Krafchenko” letters. Please tell Harry that I expect to receive parcel No. 13 in a few days and am looking forward to the canned salmon as it will be a change to the tinned beef. I wish he would give my regards to Mr. Whirely Kuttersby, who was my best friend the year I spent up in the north Klondike in the old Gold Rush of 1897. Today I have been out on the land cutting sods etc of course I am tired. This letter paper is not good but it is the best I can get. If you pack the boxes carefully they come all right. Never fail to send me well selected prunes they come well and are very good for the health. Dried fruits should be packed in boxes with a little ventilation, Quaker Oats are very good the large boxes are best… Send him my best wishes. Please send me a good cape to keep out rain the slicker kind is best as the German rain is very penetrating. You are so fond of Automobile driving I wish you could see the beautiful Roads of Hannover and Westphalia. I hope to be home this year unless this blessed war never finishes or we get blown off the map. The message hidden in the stylized words is a blatant request for a road map, cut into pieces and sent in Quaker Oats boxes: “cutting paper come all right packed in Quaker Oats boxes Send me a good German Automobile Roads of Hannover and Westphalia map”. 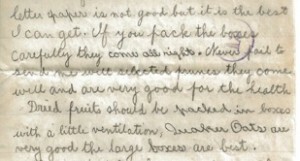 Alldritt’s coded request for a map can be seen in this letter excerpt. By the way there is a prune factory on Hargrave or Carlton Street managed by Billy Findlay who pack a good size box suitable for export. If you will buy some of them and pack them carefully in the next parcel you send me I am sure they will be appreciated when they reach me. There is no record of a prune factory located in downtown Winnipeg during this time. Robert Alldritt is still trying to make sense of a box of his grandfather’s letters he recently inherited, and is working on an interactive web “story map” chronicling his life of adventure. As an example, Minden, where he was imprisoned in the Spring of 1916, was considered to be a “repression type of camp” designed to force volunteer labour. Daniel J. McCarthy, The Prisoner of War in Germany, (New York: Moffat, Yard and Co., 1918) pp. 90-92. For an excerpt of Alldritt’s own statement regarding his treatment see Desmond Morton, Silent Battle: Canadian Prisoners of War in Germany, 1914-1918, (Toronto: Key Porter, 1992), pp. 109-110. W.A. Alldritt letter to Agnes Kennedy, from The Hague, March 24, 1918. Unless otherwise noted, correspondence is from the unpublished letters of W.A. Alldritt. Nellie McClung, Three Times and Out: As told by Pte. M.C. Simmons, (Boston and New York: Houghton Mifflin Co., 1918), p. 104. C.V. Combe letter to Ethel Alldritt, from Mürren, November 8, 1916, Part of W.A. Alldritt letters collection. Manitoba Free Press, “Wilson Appointed Assistant Secretary” Jan. 28, 1918, p.20. ActiveHistory.ca is featuring this post as part of “Canada’s First World War: A Centennial Series on ActiveHistory.ca”, a multi-year series of regular posts about the history and centennial of the First World War. See our Call for Blog Posts for information about submitting to the series. It is truly a small world, where we would grow up in the same small town, and go to the same high school. My grandfather, James Erskine Sjoquist, died 2 days after your grandfather was captured on the same battlefield. James was part of the 2nd Battalion, Royal Sussex Regiment. Could the Sept.1915 letter be his way of requesting pruning shears?